The loft at the hideaway is finally useable!! Just in time for Camp Retz the end of this month. 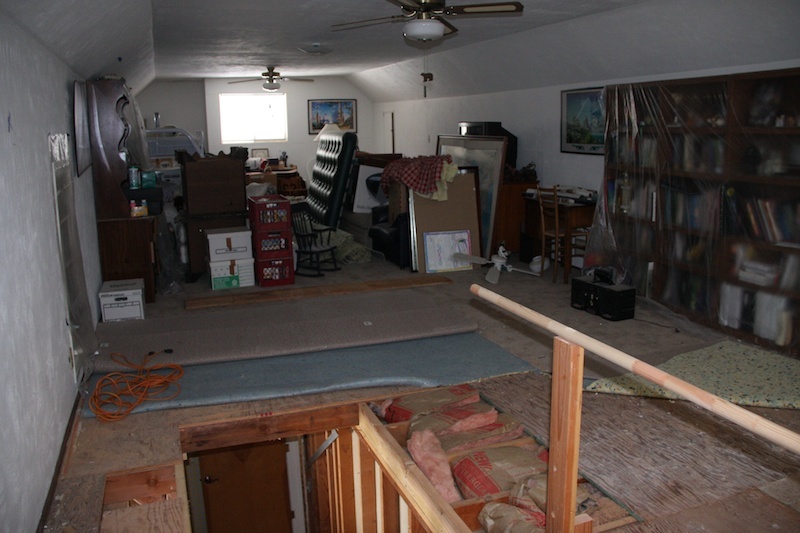 In the fall of 2010, our contractor started working on changing the layout of the 2nd floor. We wanted the stairs moved to the main part of the house instead of in the mudroom at the back of the house, far from the heartbeat of the home. It took 3 years for it to finally be done, but the wait was worth it! In reality, it really didn't take 3 years to finish, he only worked on it during the cold months, so just 2 1/2 fall & winter seasons - 2010, 2011 and some of 2012. This is what it looked like in February 2011. The new stairs have been built up enough so can walk upstairs! He also repaired some of the weak floorboards. But there is still a lot to do. And you can see all of our storage junk piled up high in a mess. A year and a half later, in October 2012, all the major construction is done. He custom made all the wood railings himself. There's just a lot of cleanup that he needed to finish up before we could even tackle our own clean up. He used the 2nd floor as his workshop, so there was unfathomable amounts of construction dust layered over everything. He put up some plastic sheeting as a small barrier between our junk and his workshop so it helped a little bit, but of course, construction dust has a mind of its own. Finally in March this year, all of his construction stuff was gone. Just our junk remained. Stuff we hadn't seen in 3 years. Stuff that we shoved up here in 2010 when we moved from San Jose to San Francisco and we couldn't bring with us to The City but we couldn't part with it yet. So that March weekend we were up, I set out to get as much junk cleared out as I could. I vacuumed a half dozen times, I swiffered so much dust, I sneezed and coughed, but I made a little dent. 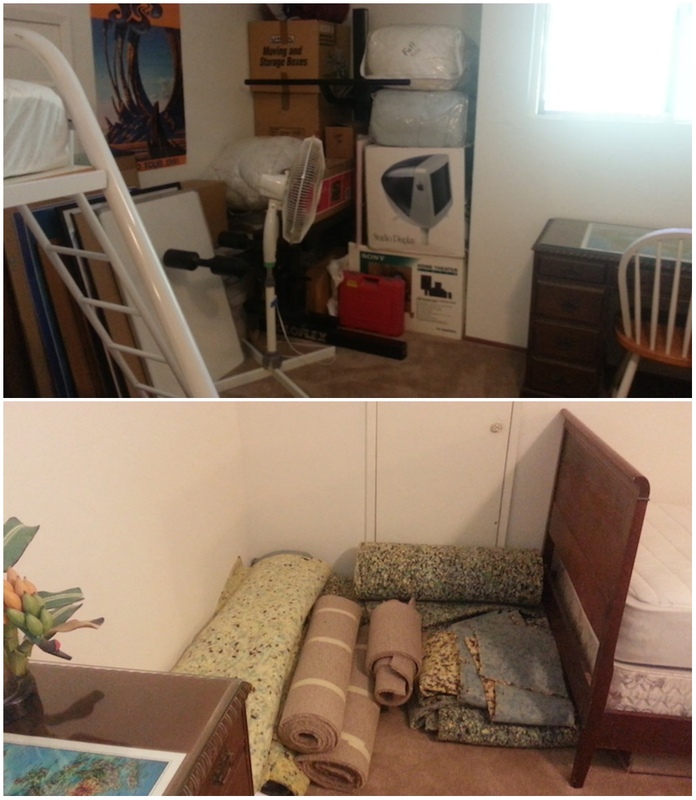 I had a big pile of stuff next to the stairs ready to take to Goodwill. 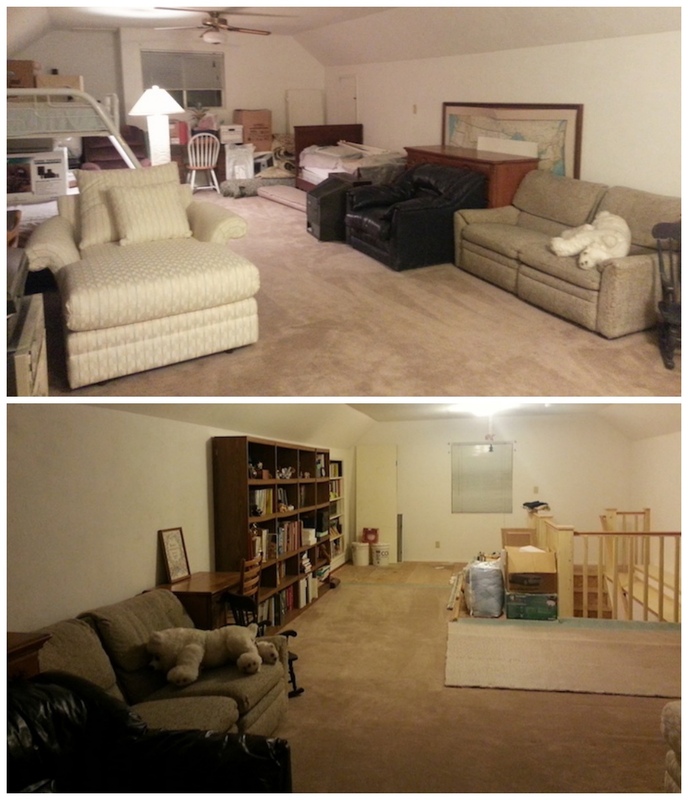 Now all I needed was the carpet to be put back in place as well as possible, and I could move some furniture around. 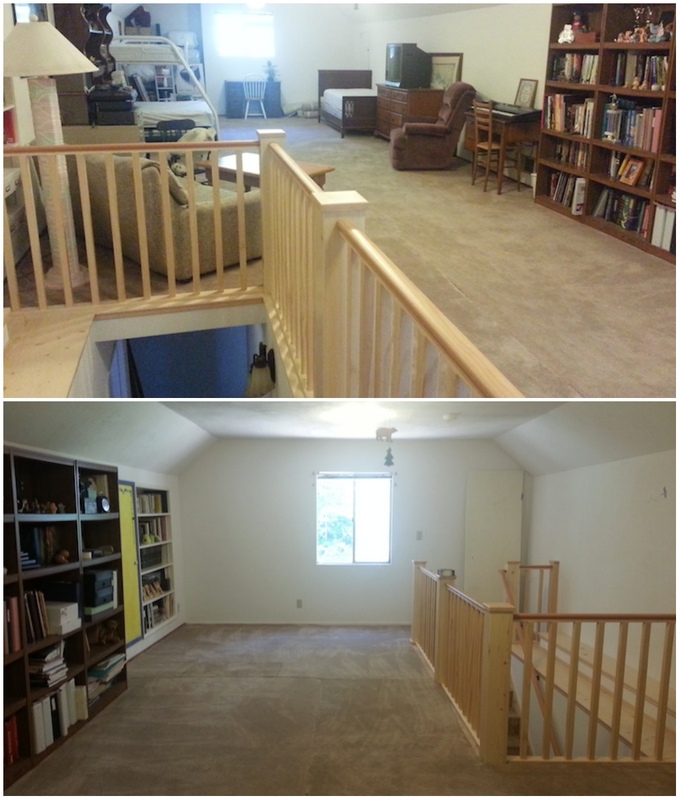 During our last visit in June, Jimmy cut the carpet for me and patched up the spots where the subfloor was exposed. It's not pretty, but it's oh so very much nicer. Eventually we'll have the whole place recarpeted, but we'll wait till all construction is complete. 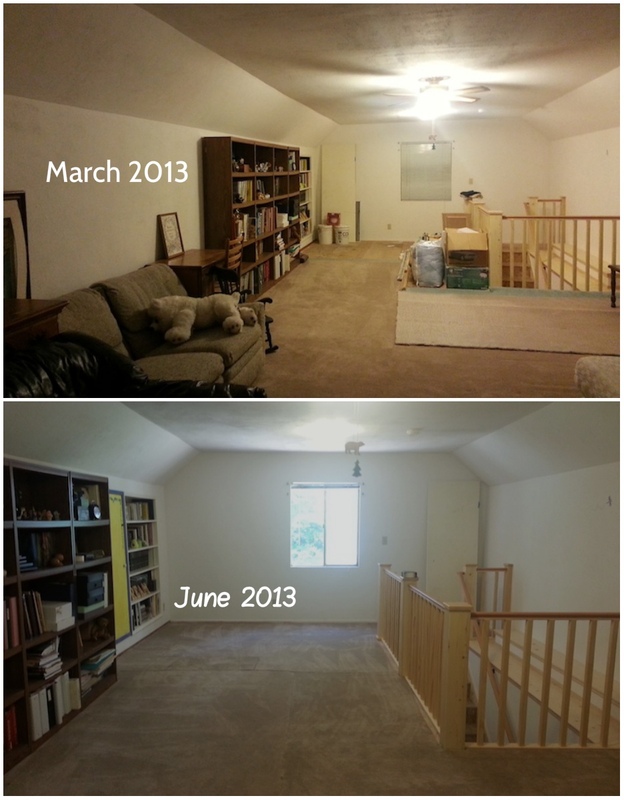 Finally, the loft is ready for habitation. The nephews and their friends are coming the end of this month, and for the 1st time in 3 years, they'll all be able to sleep and hang out up there. There's still quite a bit of work to do. 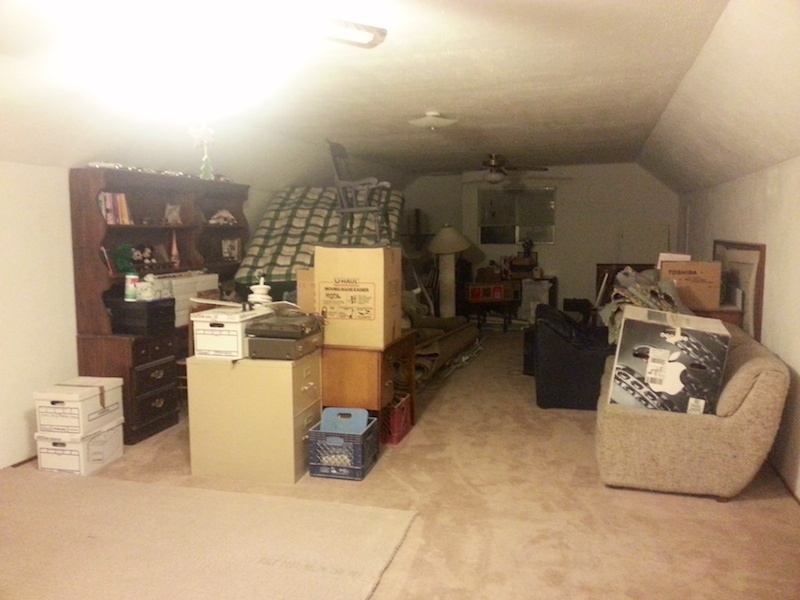 We've got a few boxes to sort though, and some carpet and padding that we need to figure out what to do with. But those are neatly stacked in corners and shouldn't get in their way. The front of the loft. That window looks over the deck and the front yard. By the way, eventually, we'd love to make that window into french doors with a very small balcony that overlooks the deck. Just a standing balcony, probably not even big enough for a chair. We don't think the roofline will allow for more than that. 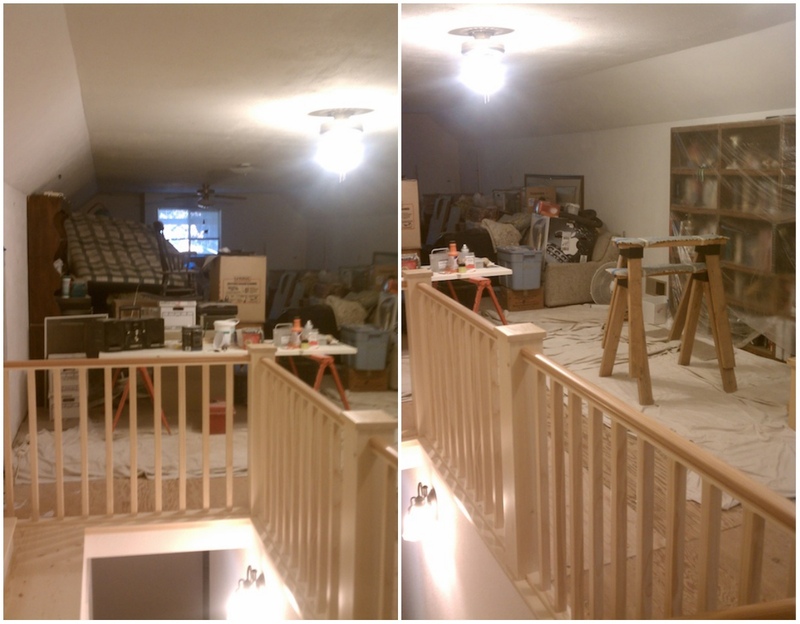 And this is the back of the loft, with the brand new stairs. That window overlooks the backyard. We have no plans for changing it, aside from maybe putting in better glass when we do the balcony in the front. Finally feeling pretty satisfied after not being able to see the light at the end of the tunnel for so long. Now bring on those nephews...Camp Retz is ready!!! Yay! Anything that has to do with home renovation seem to take longer than it should. Glad it's up and running and would hold laughters soon. I can just imagine the thrill and satisfaction of accomplishment. YAY!